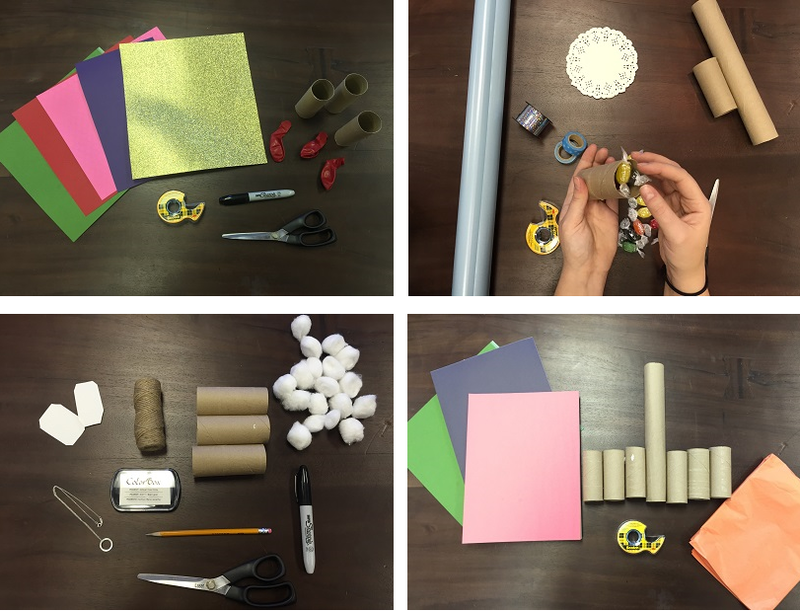 Celebrate the Hindu festival of lights with these colourful crafts! 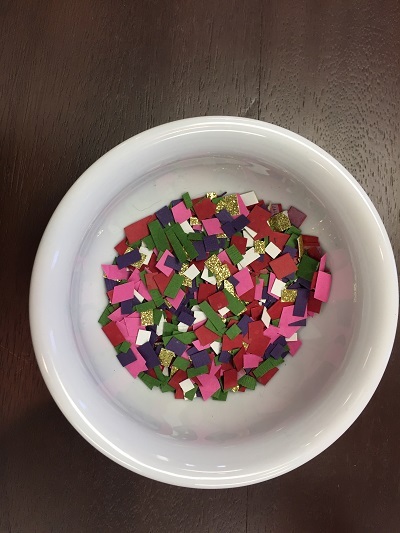 Cut some of the colored/patterned paper into tiny squares to create the confetti (about 3 tablespoons worth PER firework). Set aside. 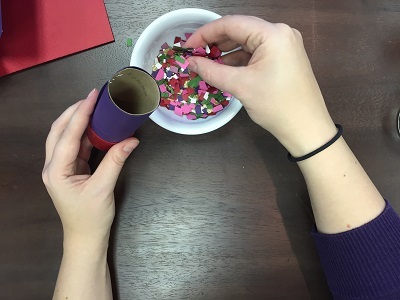 Decorate the outside of the roll with fun designs (using markers) or by wrapping them in colorful/patterned paper. 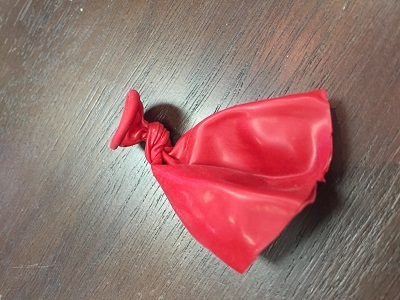 Cut each balloon in half and tie a knot in the end you’d normally blow in to. 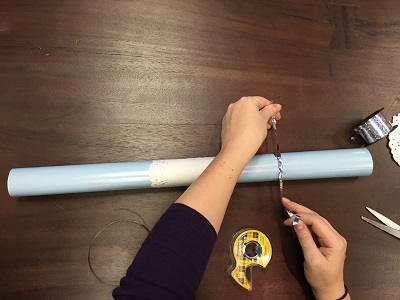 Take the tied end of the balloon and stretch it over one end of the roll and secure with tape. 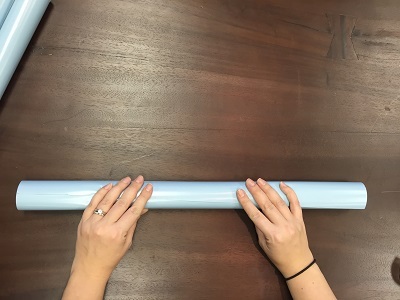 When taping, try your best to keep the balloon stretched tight but don’t bend the roll. 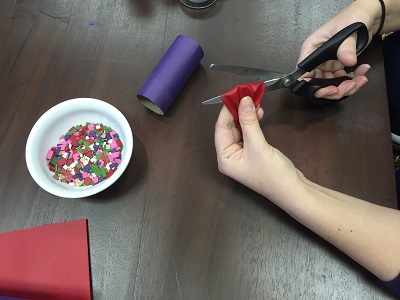 Flip the roll upside down and add the confetti. Keep it upright until you use them so the confetti doesn’t go everywhere. 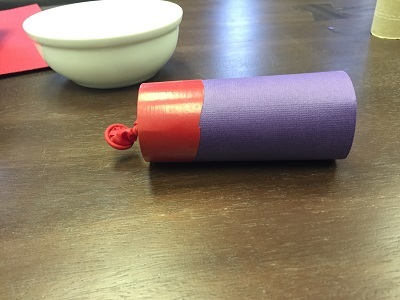 To use your homemade fireworks, point the open end away from you, pull back on the balloon end and let go. Pretty neat, right? 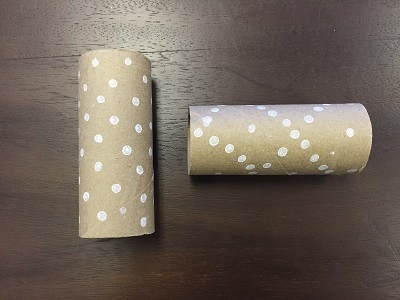 Decorate the outside of your ROYALE® Velour™ bathroom tissue roll with paint or craft paper. 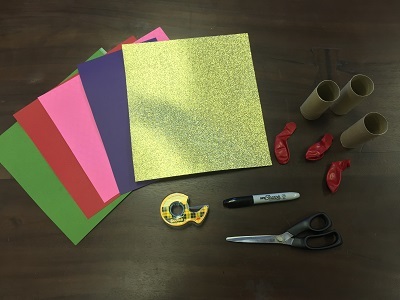 Once the paint or glue on the craft paper has dried, use your craft knife to cut long, straight lines into the roll from end to end, careful to leave ½″ buffer from the roll openings and spacing the cuts about ½″ apart. 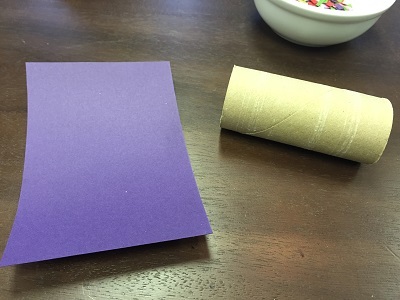 Stand your roll up and gently press down on the top, until the sides of your roll are in half. The cuts in your roll should spread apart. 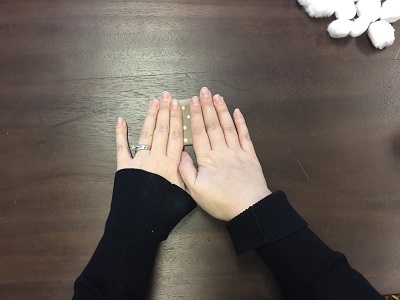 Pinch the creases for more definition. 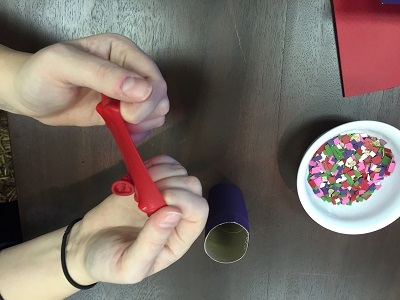 Cut a pipe cleaner into a 3″ piece. 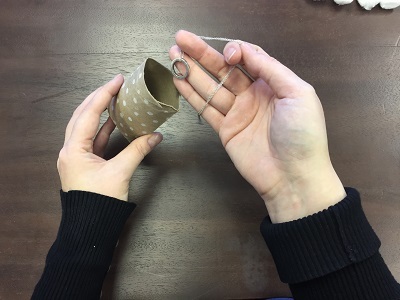 Gently bend it so the ends are lined up (but not so hard you crease it) and place it in the opening of your lantern to create a handle. Glue your handle in place. Turn a flameless tealight on, and place your lantern over top of it. 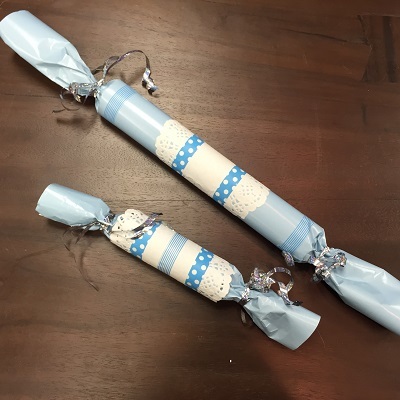 A fun and creative way to share little gifts during Hanukkah, try your hand at making homemade crackers, personalized in design and content. 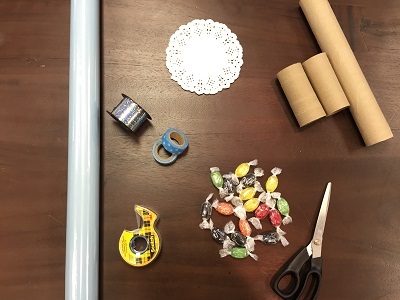 Fill each roll with the goodies you’ve chosen. 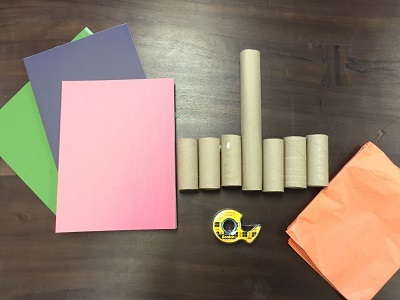 Cut paper for each roll. 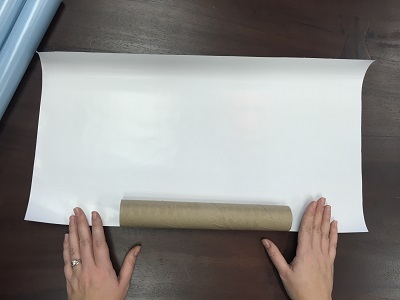 The paper should be twice as long and wide as the roll (so there’s overhang on each end and enough paper to wrap around the roll twice). 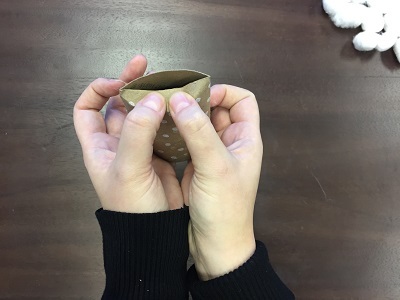 Once the paper is cut, place the roll in the center of a piece, so that there is an equal amount of overhang on each end. 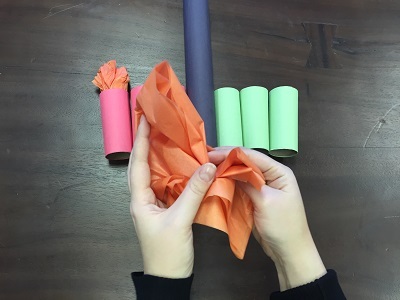 Wrap each roll twice in crepe paper or wrapping paper. 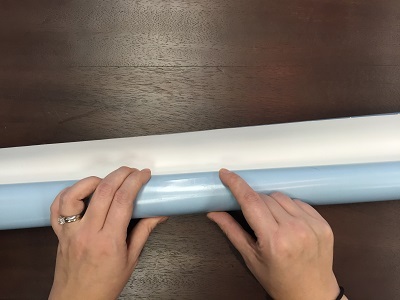 Secure the outer edge of paper to the roll with double-sided tape. 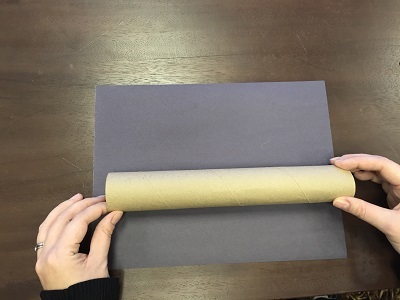 Line the tape up with the underside of the loose end of paper and then press it into the roll. Add a doily next. 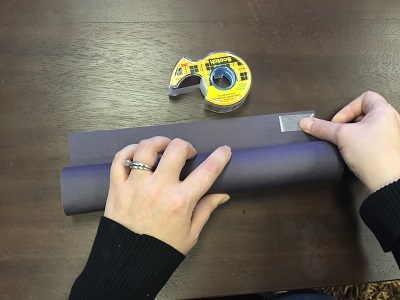 Wrap it around the roll, over the paper, and secure with double-sided tape as well. 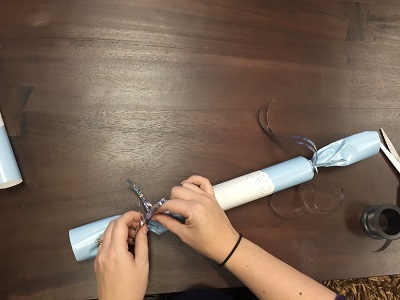 Close both ends by tying a piece of ribbon around the overhanging paper (as close to the roll as possible.) 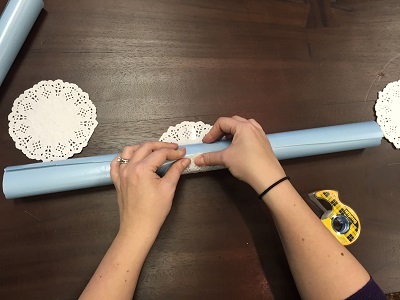 Once the ribbon is in place, curl the ends with your scissors. 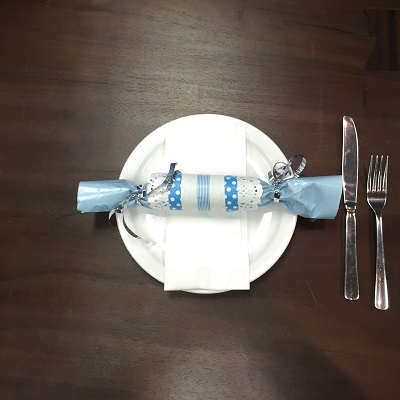 You can embellish the design of your crackers as much as you want by tying ribbon around the center of the roll, drawing designs on the doily and paper with metallic markers or glitter pens, or adding stickers – whatever you like! 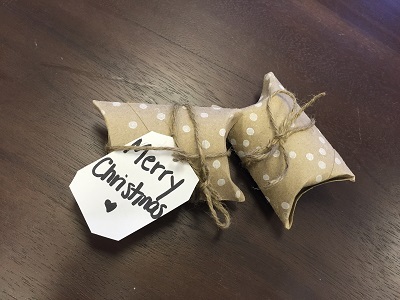 Looking for the perfect little box to hold a stocking stuffer or piece of jewelry? 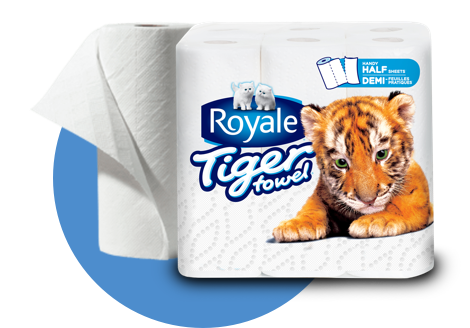 Make one yourself with a little help from ROYALE®. 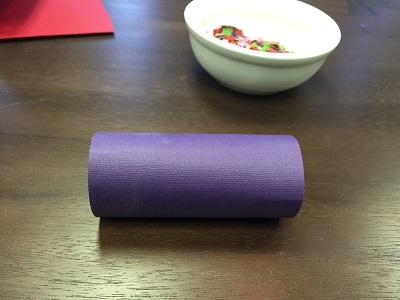 Decorate the outside of the roll first. 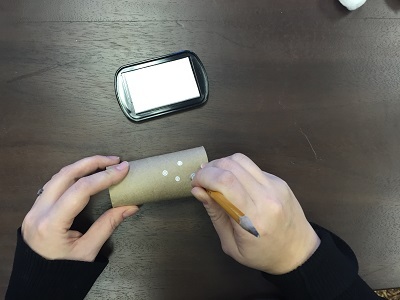 Wrap it with paper or add white polka dots by dabbing the pencil eraser with white ink and stamping it on to the roll. 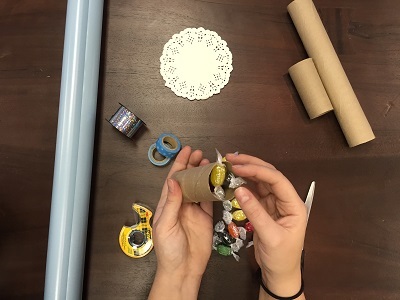 Once the roll is decorated, flatten it completely in half. 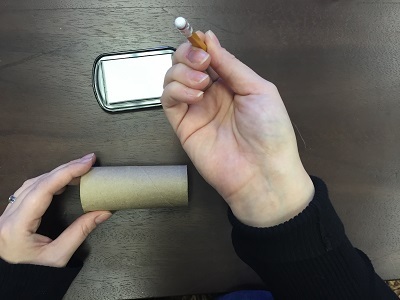 With one end of the roll facing up, press a side of the roll towards the other. 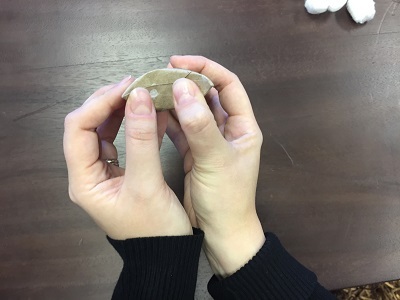 Make the crease of the fold nice and sharp by running your nail along the fold. 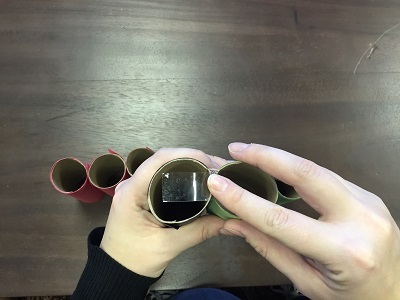 Press the other side of the roll towards the folded one, closing that end of the roll. 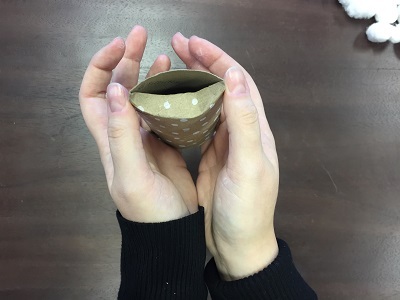 Flip the roll and repeat the process with both sides of the other end. Your box is almost finished. Place the gift inside and close it up. 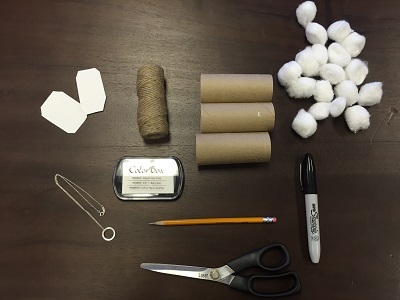 Complete the package by tying the tag to the box with twine and you’re all set! 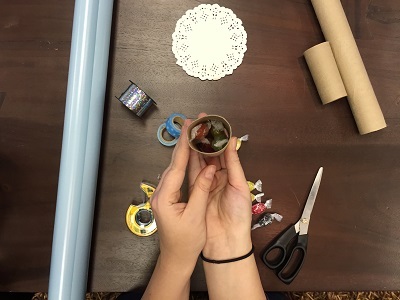 Help children make their own flameless Kwanzaa candles using empty ROYALE® rolls. 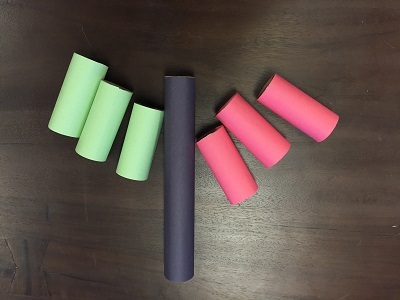 Paint or cover the empty rolls with construction paper. 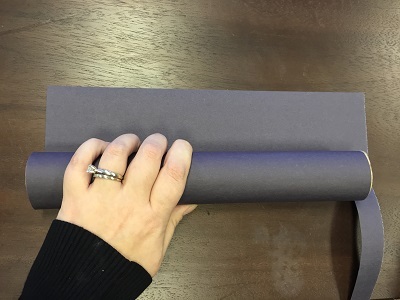 The longest roll (the Tiger Towel® paper towel roll) will be black. 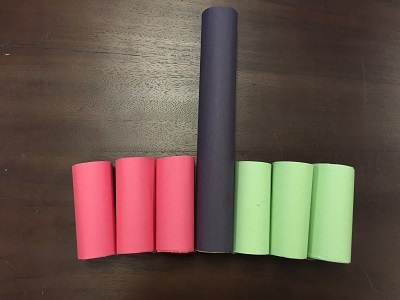 3 of the smaller rolls will be red and the remaining 3 will be green. 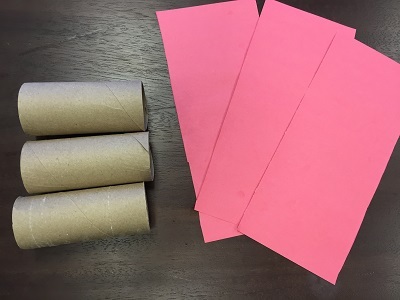 Glue or tape the rolls together in a row, with the 3 red rolls on the left, the black roll in the center, and the 3 green rolls on the right. 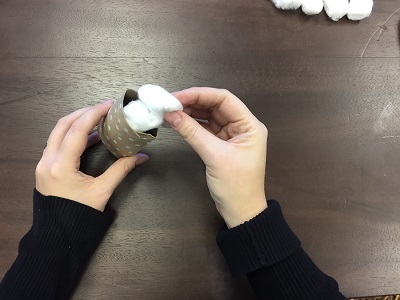 Once the rolls are ready (and dry, if you used paint), crinkle up a bit of tissue paper and tuck it into one end of each roll to create the flame. 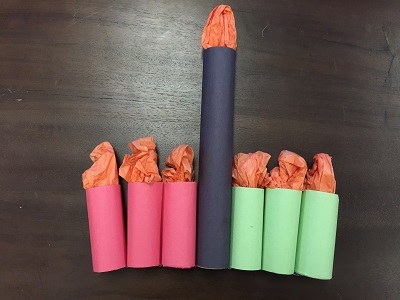 Adjust the tissue paper until it looks like a long flame.